I've spotted some new members perusing the forum feel free to come and say hello! Have to second that! 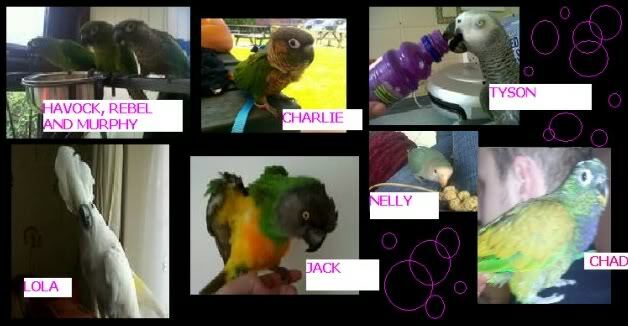 Gone so quiet lately and would be lovely to chat to someone about our birds and the problems we have to deal with. Last night I got bitten by our Macaw Chaz for no other reason than putting his girlfriend back into her cage for their sleep time. He was not amused and clamped his huge beak onto my arm and nearly chomped his way through to the other side. Had to clench my teeth and mop up the blood then put him into his cage, all in that order. We would not put up with this behaviour from any other pet but a bird! They seem to get away with murder. Do realise the old hormones are probably coming into play but talk about biting the hand that feeds you! That sounds painful Anne, they are buggers aren't they! I called him worse than that Holly at the time! He is all sunshine and light this morning and blowing me kisses right left and centre. Expect this treatment will carry on when his girlfriend is on the scene and he is showing off once again and protecting her! Poor John is not allowed to remove his food bowls in the morning but think because of my colourful language yesterday he showed me respect and let me do it! Even when I am quaking with them and their behaviour (thinking more of Annabel Lectur our blue front Jay) I would never show it as then they have truely won that round. Mainly this is a peaceful home with not much biting going on but once the hormones dip in we are in trouble. yes we don't bite honest, only our birds! !He he. Hi I'm mike I'm a new member and here for any advice I can get on my eclectus Charlie I see I'm not the only one that taste good to parrots haha. Hi Mike, Yep we all suffer from our parrots bites, they seem to have a taste for us humans!